Prime Minister’s (PM) Laptops Scheme Phase IV & V registration dates has been extended till 30th November 2017. PM Laptop Scheme phase IV and V is for Candidates who have excellent academic record. The objective of PM Laptop scheme is to boost the scope of research and quality education in the country and increase the access to information technology and new development in education sector so that students can contest with the world. Prime Minister’s Laptops scheme was initially launched in 2013-14 to distribute 200,000 laptops to the bright students of Pakistan and Azad Jamu Kashmir (AJ&K). HEC is the main controlling body of PM laptop scheme Phase IV. Registration dates for Prime Minister’s Laptops Scheme Phase IV & V has been started. Last date for registration is 30th November 2017. Candidates have to register themselves before last date. www.pakprep.com provide more than 15000+ MCQ’s with answers and solution for the preparation of Medical Colleges, Engineering Universities, NTS test preparation, HEC/ETC Test preparation and Pakistan Armed Force test preparation. To start your preparation for ETEA Medical, MDCAT, ECAT, Sindh MCAT, ETEA Engineering, NUST, GIKI, Army, Navy, PAF and Army Medical College test Click here. Here are the details of Applying for PM Laptop Scheme 2017. This entry was posted in Misc, Scholarships and tagged Chief Minister (CM) Punjab Mian Shahbaz Sharif Laptop Scheme, Chief Minister (CM) Punjab Mian Shahbaz Sharif Laptop Scheme 2017, Chief Minister Punjab Mian Shahbaz Sharif Laptop Scheme, Chief Minister Punjab Mian Shahbaz Sharif Laptop Scheme 2017, CM Punjab Laptop, CM Punjab Laptop criteria, CM Punjab Laptop Eligibility, CM Punjab Laptop Eligibility criteria, CM Punjab Laptop Eligibility criteria 2017, CM Punjab Laptop scheme, CM Punjab Laptop scheme 2017, CM Punjab Laptops, Government Laptop scheme, Government Laptop scheme eligibility, Government Laptop scheme eligibility 2017, Government Laptop scheme registration, Government Laptop scheme registration date, Government Laptop scheme registration date 2017, Government Laptop scheme registration dates 2017, Government of Punjab Laptop scheme, Government of Punjab Laptop scheme 2017, Government of Punjab Laptop scheme eligibility criteria, Government of Punjab Laptop scheme eligibility criteria 2017, Government of Punjab Laptops, Government of Punjab Laptops scheme, Government of Punjab Laptops secheme 2017, HEC, HEC 2017, HEC admission, Hec affiliated Engineering Universites, HEC Affiliated Engineering Universities, HEC Affiliated Medical College, HEC Affiliated Medical Colleges, HEC Affiliated Universities, HEC Biology MCQ's, HEC Chemistry MCQ's, HEC Engineering 2017, HEC Engineering admission, HEC English MCQ's, HEC Maths MCQ's, HEC Physics MCQ's, HEC registration, HEC result 2017, HEC scholarship, HEC scholarship 2017, HEC Scholarship for Undergraduate students, HEC Scholarship test, HEC Scholarship test dates, HEC Test, HEC Test for Undergraduate, HEC Test for Undergraduate admission, HEC Test for Undergraduate admissions, HEC Test for Undergraduates, How to apply for HEC Scholarship, Laptop, Laptop distribution, Laptop Scheme, Mian Shahbaz Sharif Laptop, Mian Shahbaz Sharif Laptop Scheme, Mian Shahbaz Sharif Laptop Scheme 2017, Mian Shahbaz Sharif Laptop Scheme eligibility criteria 2017, PM Laptop criteria, PM Laptop criteria 2017, PM Laptop Eligibility, PM Laptop Eligibility criteria, PM Laptop Eligibility criteria 2017, PM Laptop registration, PM Laptop scheme 2017, PM laptops, PM laptops 2017, PM laptops Scheme, PM laptops Scheme 2017, PM laptops Scheme registration, PM laptops Scheme registration date 2017, PM laptops Scheme registration dates, PM laptops Scheme registration dates 2017, Prime Minister's Laptops, Prime Minister's Laptops 2017, Prime Minister's Laptops date, Prime Minister's Laptops dates, Prime Minister's Laptops registration, Prime Minister's Laptops registration 2017, Prime Minister's Laptops registration date, Prime Minister's Laptops registration date 2017, Prime Minister's Laptops registration dates, Prime Minister's Laptops registration dates 2017, Prime Minister's Laptops Scheme, Prime Minister's Laptops Scheme 2017, Prime Minister's Laptops Scheme registration, Prime Minister's Laptops Scheme registration date, Prime Minister's Laptops Scheme registration dates, Prime Minister's Laptops Scheme registration dates 2017 on November 24, 2017 by Pakprep.com Admin. 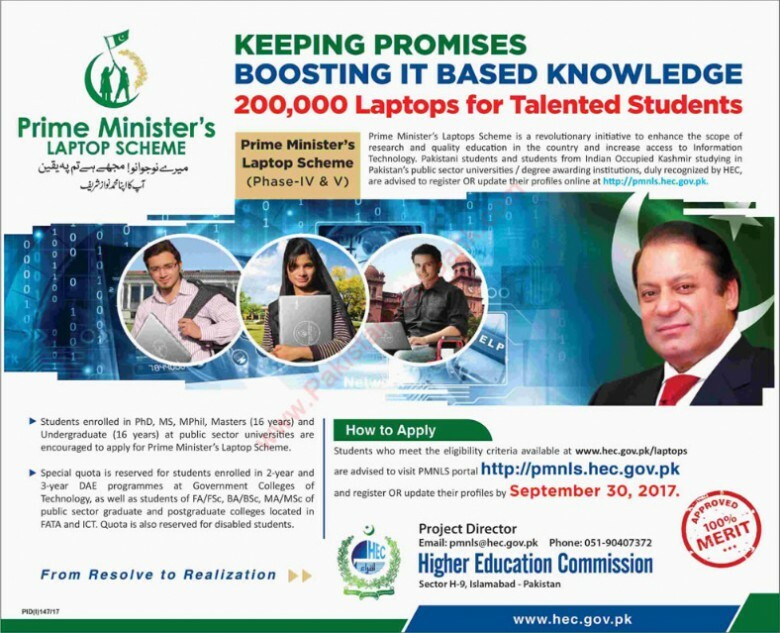 (PM) Prime Minister’s Laptops Scheme is for Student who are performing extra ordinary in their academics. Main objective of Prime Minister Laptop scheme is to enhance the scope of research and quality education in the country and increase the access to information technology to the emerging students so that they can compete with the world. Prime Minister’s Laptops scheme was initially launched in 2013-14 with a target of distributing 200,000 laptops among the brilliant students studying in Pakistan and Azad Jamu Kashmir (AJ&K). Higher Education Commission (HEC) was given the responsibility to plan the mechanism of distributing of 200,000 laptops. Registration dates for Prime Minister’s Laptops Scheme Phase IV & V has been started. Last date for registration is 30th September 2017. Students have to register themselves before last date. Existing applicants can also check their status. www.pakprep.com provide more than 15000+ MCQ’s with answers and solution for the preparation of Medical and Engineering Universities. To start your preparation for Medical Colleges and Engineering Universities Click here. Here are the details of Applying for PM Laptop Scheme 2017. This entry was posted in Misc and tagged BS Scholarship, BS Scholarship 2017, BS Scholarships, BS Scholarships 2017, Chief Minister (CM) Punjab Mian Shahbaz Sharif Laptop Scheme, Chief Minister (CM) Punjab Mian Shahbaz Sharif Laptop Scheme 2017, Chief Minister Punjab Mian Shahbaz Sharif Laptop Scheme, Chief Minister Punjab Mian Shahbaz Sharif Laptop Scheme 2017, CM Punjab Laptop, CM Punjab Laptop criteria, CM Punjab Laptop Eligibility, CM Punjab Laptop Eligibility criteria, COMSAT Scholarships, Dow University Scholarships, Engineering Scholarship, Engineering Scholarship 2017, Engineering Scholarships, Engineering Scholarships 2017, FATA Scholarship, FATA Scholarships 2016, GIK Scholarships, giki scholarship 2016, giki scholarships, GIKI undergraduate Scholarship, GIKI undergraduate Scholarships, Government Laptop scheme, Government Laptop scheme 2017, Government Laptop scheme eligibility, Government Laptop scheme eligibility 2017, Government Laptop scheme registration, Government Laptop scheme registration date, Government Laptop scheme registration date 2017, Government Laptop scheme registration dates, Government Laptop scheme registration dates 2017, Government of Punjab Laptops scheme, government scholarships, HEC, HEC 2017, Hec affiliated Engineering Universites, HEC Affiliated Engineering Universities, HEC Affiliated Medical College, HEC Affiliated Medical Colleges, HEC Affiliated Universities, HEC Biology MCQ's, HEC Engineering, HEC Engineering 2017, HEC Medical, HEC Medical 2017, HEC registration, HEC registration form, HEC scholarship, HEC scholarship 2016, HEC scholarship 2017, HEC Scholarship for Undergraduate students, HEC Scholarship test, HEC Scholarship test dates, How to apply for HEC Scholarship, Laptop, Laptop distribution, Laptop Scheme, PM Laptop criteria, PM Laptop criteria 2017, PM Laptop Eligibility, PM Laptop Eligibility criteria, PM Laptop Eligibility criteria 2017, PM Laptop registration, PM Laptop scheme 2017, PM laptops, PM laptops 2017, PM laptops Scheme, PM laptops Scheme 2017, PM laptops Scheme registration, PM laptops Scheme registration date, PM laptops Scheme registration date 2017, PM laptops Scheme registration dates, PM laptops Scheme registration dates 2017, Prime Minister's Laptops, Prime Minister's Laptops 2017, Prime Minister's Laptops date, Prime Minister's Laptops dates, Prime Minister's Laptops registration, Prime Minister's Laptops registration 2017, Prime Minister's Laptops registration date, Prime Minister's Laptops registration date 2017, Prime Minister's Laptops registration dates, Prime Minister's Laptops registration dates 2017, Prime Minister's Laptops Scheme, Prime Minister's Laptops Scheme 2017, Prime Minister's Laptops Scheme registration, Prime Minister's Laptops Scheme registration 2017, Prime Minister's Laptops Scheme registration date, Prime Minister's Laptops Scheme registration dates, Prime Minister's Laptops Scheme registration dates 2017, punjab Laptop, punjab Laptop Scheme, punjab Laptops, scholarship, scholarships, Scholarships 2015, scholarships 2016 on September 20, 2017 by Pakprep.com Admin.